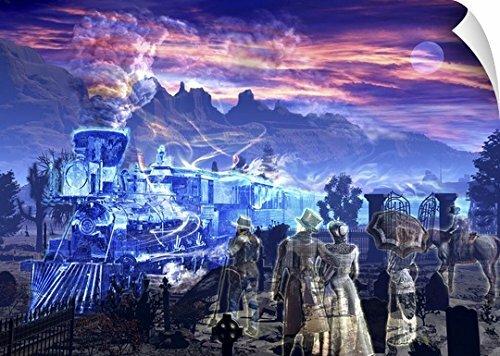 Kurt Miller Wall Peel Wall Art Print entitled Ghost train picking up some ghosts at a graveyard by Canvas on Demand at UtopyaCon. MPN: 2459412_14_48x35_none. Hurry! Limited time offer. Offer valid only while supplies last. Wall Peel entitled Ghost train picking up some ghosts at a graveyard. Ghost train picking up some ghosts at a graveyard. Multiple sizes available. Wall Peel entitled Ghost train picking up some ghosts at a graveyard. Ghost train picking up some ghosts at a graveyard. Multiple sizes available. Primary colors within this image include Dark Blue Sky Blue Black White. Made in USA. Satisfaction guaranteed. Archival-quality UV-resistant inks. Perfect for dorm rooms kid rooms doors and other untextured smooth surfaces. Wall Decals are printed on heavy grade vinyl with a matte finish.